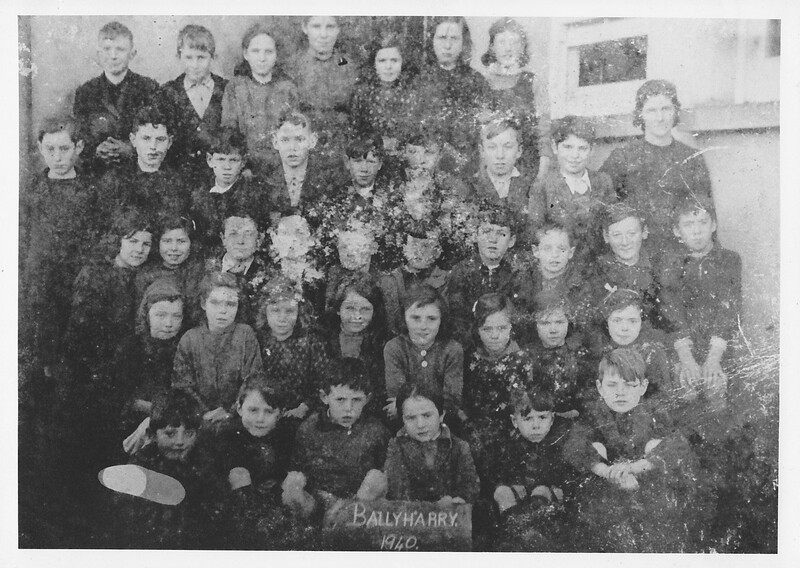 Ballyharry School 1940 - F/R: JJ Mc Feeley, Joseph Mc Feeley, Patrick Harkin, Terry Mc Guinness, Donal Mc Kinney, Corney Mc Feeley; S/R: Rose Duffy, Bridie Kelly, Nancy Doherty, Eileen Mc Feeley, Mary Harkin, Celine Mc Kinney, Cathy Mc Kinney, Rose Mc Kinney; 3/R: Lena Mc Feeley, Mary Mc Kinney, Willie Mc Guinness, Leo Mc Guinness, Dan Mc Cann, John Canavan, Charlie Canavan, Packie Kelly, Johnny Mc Feeley, James Canavan; 4/R: Hugh Mc Feeley (Ned), Patrick Mc Feeley (Ned), Herbert Mc Intyre, Seamus Kelly, Johnnie Mc Intyre, Cecil Duggan, Sam Duggan, James Long, Gracie Mc Laughlin (The Glen)(teacher); 5/R: Jimmy Mc Cann, Mick Doherty (Jack), Kitty Kelly, Nelly Kelly, Margaret Mc Kinney, Mamie Mc Guinness, Katie Mc Cann. There has been a school in Ballyharry since the mid-1800s at a place called Cnoc an Amhraic. A new school was later built along the Culdaff-Carrowmena road. Among the teachers who taught here was Master McBride, father of Judge Sean McBride. Brendan Bonner taught here also. He was an announcer on Raidio na Gaeltachta and also acted as a translator in the Dail. In the mid-1850s an inspector reported that there was only one child in the school who spoke only in the Irish language. The school closed in 1967 with the advent of free education. The picture shows Johnnie McFeely, Leo McGuinness, Kellys, Harkins, and McFeelys from the area. A full list will be made available later as Leo McGuinness can name everyone. In the third row second from right is John McFeely who died on 2 March 2012 aged 82. He was my next door neighbour for the last forty years. Thanks for contacting me re Ballyharry School. The old school was at Cnoc an Amhraic about 200 yards in front of the school your mother went to. Ballyharry had a good reputation and produced fine pupils who did well in life. that I’m complaining, but slow loading instances times will often affect your placement in google and could damage your quality score if ads and marketing with Adwords.